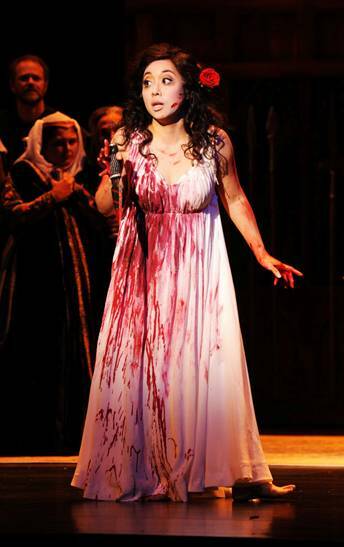 SAN JOSE, CA – DONIZETTI’s three act work LUCIA DI LAMMERMOOR, which opened the 2016-2017 Season of OPERA SAN JOSE at the California Theatre on September l0th, was flawless. On its opening night, it ran with the precision of a fine watch. The Orchestra, conducted by MING LUKE was in tune, and LUKE’s perfect acoustics control let the singers voices to be heard over the orchestra's instruments. The flute and the harp solos this night showed the purity of their sound. KIT WILDER’s sets: the forest, the garden, the cemetery and the wood-paneled interior of the Ashton's Palace transported us, visually, to the sites of the action. The lighting of SEAN A. RUSSELL, was a little dark, but utilized the red light at the suitable times. And the sumptuous costumes, designed by B. MODERN, had a touch of authenticity, and genius, by including the green and red color plaids (Tartans) wore in the second scene by Lucia and Edgardo, to demonstrate that the couple belongs to two different Scottish Clans. As for the singing, all the voices sounded marvelous on that night. The enthralling melodies of “LUCIA” were written by Italian composer GAETANO DONIZETTI in l835, (revised in l839) in the integral musical style of the Opera’s lovers in the Italy of the l830’s, which is the reason why in the score, DONIZETTI held a consistent orchestral coloring from the prologue onwards, underlining the mood with melismas. (several notes sung to one syllable of text). When first written, DONIZETTI wanted the “MAD SCENE” accompanied by a glass harmonica, which was never done, and as of today, nobody knows for sure who wrote the celebrated Cadenza for the flute, that “urges” Lucia to match its sound note by note going higher and higher, because the Flute’s music, does not appear in the original DONIZETTI’s score. Written by SALVADORE CAMMARANO, Librettist and Playwright, LUCIA’s libretto is based on a few sentences taken from the pages of The Bride of Lammermoor, a novel that relates a fictional version on an actual incident that took place in the history of the Scottish DALRYMPLE FAMILY, who lived in The Lammermuir Hills (Scottland) in l669. The novel is one of several Sir WALTER SCOTT’s novels illustrating the aspects of the Scottish region at the time. The tragic love story told in LUCIA DI LAMMERMOOR the opera, is the story of a noble Scottish girl, Lucia (SYLVIA LEE) who is in love with Edgardo (KIRK DOUGHERY) a noble Scottish man who belongs to Lucia’s enemy clan. 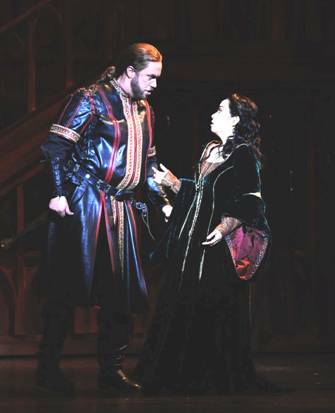 In battle, Lucia’s brother Enrico (MATTHEW HANSCOM) killed Edgardo’s father and stole, Lammermoor, his castle. Because, the castle is now in decay, and the family destituted, ENRICO arranged for his sister to marry Arturo (MICHAEL MENDELSOHN) an old rich man. 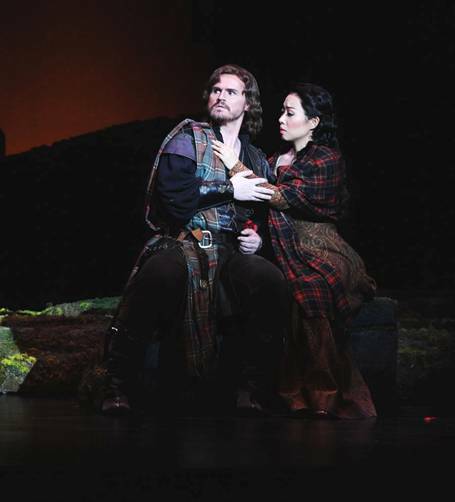 The Opera begins with Enrico (HANSCOM) in the forest outside Lammermoor, searching with his soldiers for the man, he had been told by Normanno (YUNGBAE YANG) a soldier, that Lucia (LEE) has been meeting behind his back. Learning that the man is Edgardo (DOUGHERTY) his mortal enemy, he get very upset. In OSJ's production, the scene delighted the audience with the voices of a rich-sounding men’s chorus (ANDRE WHITFIELD, Chorus master) the pleasant, but too soft, voice of tenor YANG and a realistic impersonation of Enrico who HANSCOM represented, masterfully as a selfish, cruel man. The scene is followed by the scene at the fountain, that musically, is the best scene in the Opera for the beauty of its melodies. Here we hear the duet between Alisa (ANNA YELIZAROVA) Lucia’s lady in waiting, and Lucia in which Lucia tells her the story of the woman that was killed at the fountain, (They are both looking at) whose ghost she (Lucia) admits seen once. Lucia's revelation, is sang in pure Bell Canto (perfect sone production) singing the highest Lyric soprano’s tones ornamented by melismas. LEE, mastered both, her dramatic role (BENJAMIN SPIERMAN directed the Production as Stage Director) and the difficult singing, which in her exquisite tone of voice sounded majestic. On that night, her aria, was followed by loud BRAVOS, and applause. And because the performers were superb, there were many Loud BRAVOS heard on that night. 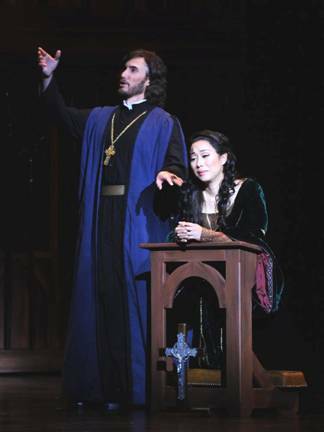 The sonorous mellow voice of Lyric Bass RAMSEY, (pictured below with LEE as Lucia) helped to put realism in his role as priest, telling Lucia in that by Marrying Arturo, she may have a miserable life here on earth but that she will eventually find peace and be rewarded in heaven. Was heard, when warning both Enrico (HAMSCOM) and Edgardo (DOUGHERTY) who are about to fight (with their swords) that “He who lives by the sword dies by the sword,” And at the end, in a powerful performance, was heard softly, when standing in front of the wedding guests tells them the horror that he has just seen in Lucia’s bed chamber. His voice still resonant but singing at an slower tempo, modulating every tone, his hands still dripping with Arturo’s fresh blood. RAMSEY's acting of the role was powerful. And probably, more powerful, was his remorse for his actions. As a priest, and as a man. Because he kwos that he had double crossed Lucia, the girl he was supposed to protect. As Raimondo, the character he played, he knew how much Lucia loved Edgardo. He knew that Enrico had hidden Edgardo’s letters to Lucia. He knew that as a Priest, Lucia, who had just lost her mother, trusted him and believed he was on her side, and knowing that, he lied to her and help Enrico convince her that the letter he, Raimondo, showed Lucia, in which Edgardo admitted loving other woman, was a fake. So in his acting his role, RAMSEY had to show a lot of guilt while playing Raimondo, because it was him who drove Lucia to insanity. He was convincing. The best performance of a night, in which every performance was true to life, however, goes to the South Korea soprano, SYLVIA LEE ( pictured below) Her “mad scene” was wonderful, represented with such realism, that brought tears to our eyes. And her singing in which she imitates every note the flute, plays going up the pentagram and embelishing some notes with melismas, was perfect Bell Canto. Her ovation was long, and the BRAVOS loud. LUCIA DI LAMMERMOOR was one of the best productions presented by OPERA SAN JOSE. His opening night performance had many solo arias followed by applause and loud Bravos. It had mor bravos, and a long standing ovation at the end. It can only be described with one adjetive: MARVELOUS.